Happy New Years! The January issue of Circuit Cellar magazine is coming soon. Don’t miss this 1st issue of Circuit Cellar 2019. Enjoy pages and pages of great, in-depth embedded electronics articles. CC Magazine – Sign Up Now! Consumer and commercial drones represent one of the most dynamic areas of embedded design today. 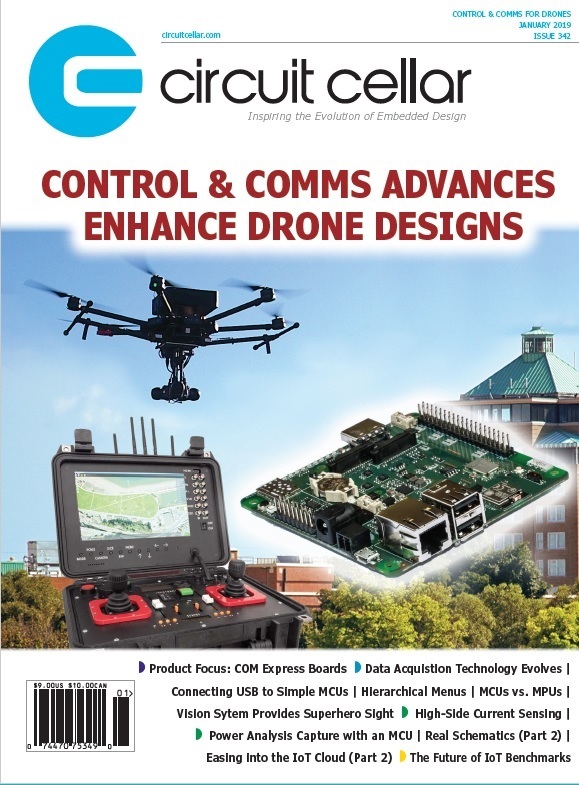 Chip, board and system suppliers are offering improved ways for drones to do more processing on board the drone, while also providing solutions for implementing the control and communication subsystems in drones. This article by Circuit Cellar’s Editor-in-Chief Jeff Child looks at the technology and products available today that are advancing the capabilities of today’s drones. As MCU performance and functionality improve, the traditional boundaries between MCUs and microprocessor units (MPUs) have become less clear. In this article, Jacko examines the changing landscape in MPU vs. MCU capabilities, OS implications and the specifics of new SiP and SOM approaches for simplifying higher-performance computing requirements in industrial applications. The COM Express architecture has found a solid and growing foothold in embedded systems. COM Express boards provide a complete computing core that can be upgraded when needed, leaving the application-specific I/O on the baseboard. This Product Focus section updates readers on this technology and provides a product album of representative COM Express products. Sometimes you want to connect a USB device such as a flash drive to a simple microcontroller. Problem is most MCUs cannot function as a USB host. In this article, Stuart steps through the technology and device choices that solve this challenge. He also puts the idea into action via a project that provides this functionality. In this project article, learn how these two Cornell students designed a system to overlay images from a visible light camera and an infrared camera. They use software running on a PIC32 MCU to interface the two types of cameras. The MCU does the computation to create the overlaid images, and displays them on an LCD screen. While the fundamentals of data acquisition remain the same, its interfacing technology keeps evolving and changing. USB and PCI Express brought data acquisition off the rack, and onto the lab bench top. Today solutions are emerging that leverage Mini PCIe, Thunderbolt and remote web interfacing. Circuit Cellar’s Editor-in-Chief, Jeff Child, dives into the latest technology trends and product developments in data acquisition. Jeff says he likes being able to measure things—for example, being able to measure load current so he can predict how long a battery will last. With that in mind, he recently found a high-side current sensing device, Microchip’s EMC1701. In his article, Jeff takes you through the details of the device and how to make use of it in a battery-based system. Low-cost microcontrollers integrate many powerful peripherals in them. You can even perform data capture directly to internal memory. In his article, Colin uses the ChipWhisperer-Nano as a case study in how you might use such features which would otherwise require external programmable logic. In Part 1 of this article series Brian examined some of the technologies and services available today enabling you to ease into the IoT cloud. Now, in Part 2, he discusses the hardware features of the Particle IoT modules, as well as the circuitry and program code for the project. He also explores the integration of a Raspberry Pi solution with the Particle cloud infrastructure. In his December article, Aubrey discussed his efforts to build a display subsystem and GUI for embedded use based on a Noritake touchscreen display. This time he shares how he created a menu system within the constraints of the Noritake graphical display system. He explains how he made good use of Microsoft Excel worksheets as a tool for developing the menu system. The first part of this article series on the world of real schematics ended last month with wiring. At high frequencies PCBs suffer from the same parasitic effects as any other type of wiring. You can describe a transmission line as consisting of an infinite number of infinitesimal resistors, inductors and capacitors spread along its entire length. In this article George looks at real schematics from a transmission line perspective. The December issue of Circuit Cellar magazine is coming soon. Don’t miss this last issue of Circuit Cellar in 2018. Pages and pages of great, in-depth embedded electronics articles prepared for you to enjoy. Gone are the days when supercomputing levels of processing required a huge, rack-based systems in an air-conditioned room. Today, embedded processors, FPGAs and GPUs are able to do AI and machine learning kinds of operation, enable new types of local decision making in embedded systems. In this article, Circuit Cellar’s Editor-in-Chief, Jeff Child, looks at these technology and trends driving embedded supercomputing. Deep learning using convolutional neural networks (CNNs) can offer a robust solution across a wide range of applications and market segments. 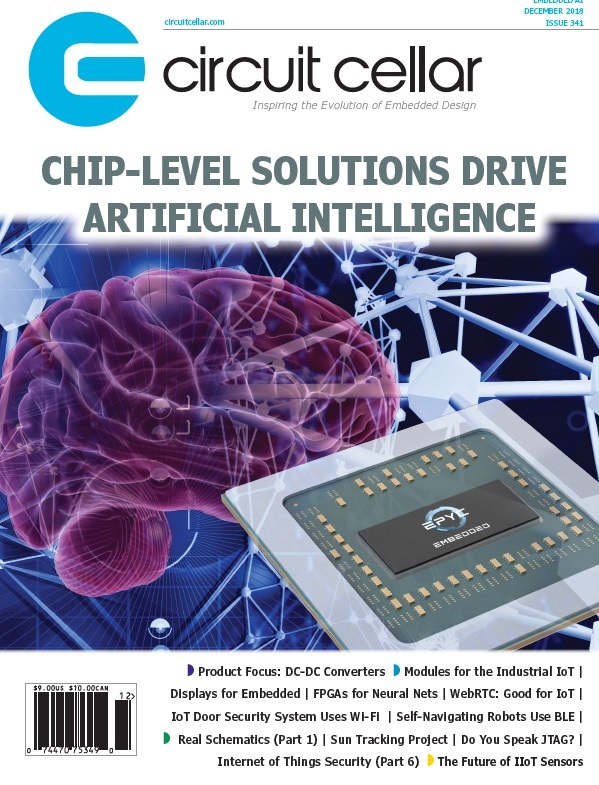 In this article written for Microsemi, Ted Marena illustrates that, while GPUs can be used to implement CNNs, a better approach, especially in edge applications, is to use FPGAs that are aligned with the application’s specific accuracy and performance requirements as well as the available size, cost and power budget. DC-DC conversion products must juggle a lot of masters to push the limits in power density, voltage range and advanced filtering. Issues like the need to accommodate multi-voltage electronics, operate at wide temperature ranges and serve distributed system requirements all add up to some daunting design challenges. This Product Focus section updates readers on these technology trends and provides a product gallery of representative DC-DC converters. Our magazine readers know that each issue of Circuit Cellar has several circuit schematics replete with lots of resistors, capacitors, inductors and wiring. But those passive components don’t behave as expected under all circumstances. In this article, George Novacek takes a deep look at the way these components behave with respect to their operating frequency. While most engineers have heard of JTAG or have even used JTAG, there’s some interesting background and capabilities that are so well know. Robert Lacoste examines the history of JTAG and looks at clever ways to use it, for example, using a cheap JTAG probe to toggle pins on your design, or to read the status of a given I/O without writing a single line of code. The Industrial Internet-of-Things (IIoT) is a segment of IoT technology where more severe conditions change the game. Rugged gateways and IIoT edge modules comprise these systems where the extreme temperatures and high vibrations of the factory floor make for a demanding environment. Here, Circuit Cellar’s Editor-in-Chief, Jeff Child, looks at key technology and product drives in the IIoT space. Continuing on with his article series on IoT security, this time Bob Japenga returns to his efforts to craft a checklist to help us create more secure IoT devices. This time he looks at developing a checklist to evaluate the threats to an IoT device. Web Real-time Communications (WebRTC) is an open-source project created by Google that facilitates peer-to-peer communication directly in the web browser and through mobile applications using application programming interfaces. In her article, Callstats.io’s Allie Mellen shows how IoT device communication can be made easy by using WebRTC. With WebRTC, developers can easily enable devices to communicate securely and reliably through video, audio or data transfer. Learn how three Cornell students, Norman Chen, Ram Vellanki and Giacomo Di Liberto, built an Internet connected door security system that grants the user wireless monitoring and control over the system through a web and mobile application. The article discusses the interfacing of a Microchip PIC32 MCU with the Internet and the application of IoT to a door security system. Navigating indoors is a difficult but interesting problem. Learn how these two Cornell students, Jane Du and Jacob Glueck, used Received Signal Strength Indicator (RSSI) of Bluetooth Low Energy (BLE) 4.0 chips to enable wheeled, mobile robots to navigate towards a stationary base station. The robot detects its proximity to the station based on the strength of the signal and moves towards what it believes to be the signal source. Most solar panel arrays are either fixed-position, or have a limited field of movement. In this project article, Jeff Bachiochi set out to tackle the challenge of a sun tracking system that can move your solar array to wherever the sun is coming from. Jeff’s project is a closed-loop system using severs, opto encoders and the Microchip PIC18 microcontroller. In this project article, Aubrey Kagan takes us through the process of developing an embedded system user interface subsystem—including everything from display selection to GUI development to MCU control. For the project he chose a 7” Noritake GT800 LCD color display and a Cypress Semiconductor PSoC5LP MCU.